Got a call from a blocked number while I was writing the last post. I get a lot of these, but this one left a weird voicemail. Could be an issue with the digital recording or something at the beginning, but still… weird. Any clues? Feel free to listen online or to download the MP3. Also, if you remix it into a song, I at least want a mention in the credits. Ninja Edit: On the plus side, this is another reason why I love Google Voice. It took me under a minute from getting this weirdness to posting it on the blog. Seriously, Google Voice is awesome. Well, here’s why you see those news articles making claims that are provably false: Sometimes, people lie in science journals. 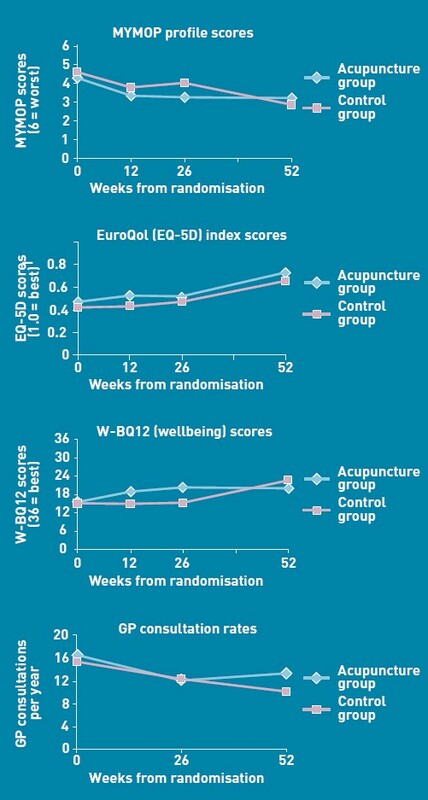 For the acupuncture one, take the recent case of “Acupuncture for ‘frequent attenders’ with medically unexplained symptoms: a randomised controlled trial (CACTUS study)” that was published in the June issue of the British Journal of General Practice. This was covered pretty well on DC’s Improbable Science blog. The chart is here on the right hand side of this post. Now, when a news organization gets ahold of this, they’re not going to examine the data and see that the conclusion is a bald-faced lie. They’re just going to take it at face value. And that’s how you get stories with titles like “Why GPs should be prescribing acupuncture to patients branded hypochondriacs” or “Acupuncture has significant impact on mystery illnesses“, even though the results are exactly opposite. However, the charts themselves in that PDF file say otherwise. On page 3, for the male charts (fig 1 and 3), they don’t show 12-h sucrose at all. For the female ones (fig 2 and 4), sucrose is higher than HFCS for both of the 12 hour results. The fact that the ad libitum charts are higher is expected results, because those are the controls on the high end (ad libitum = “at will”, meaning the rats could eat all the HFCS they wanted, so you’d expect them to get fatter, even though they don’t always). It does show that the males at 8 weeks did have a higher average weight than with sucrose (Table 1 on page 2), however it also shows that males with access to 24-hour HFCS (which is the high-end control) had similar weight gain to males with access to 12-h sucrose, which pretty much negates those results as significant. Now, that paper isn’t all bad, but when the results actually disagree with the title of the paper, you have to question it a bit. It does show that triglycerides will be higher with HFCS, but that’s not unexpected, as fructose is what turns into triglycerides and the HFCS they’re using has more fructose than sugar does. But the actual weight and increased body fat results all show up as higher on sugar there instead of HFCS. Reading the text, they sometimes appear to be confusing one of the control groups (ad libitum HFCS) with the actual groups being studied against one another (12-h HFCS vs 12-h sucrose). Sure, if you give a rat all the HFCS they want, they get fat. That falls under a “duh” category. What matters is the comparison between similar groups, and you can’t draw the conclusions they drew from the results they got. Even their low end control groups (ad libitum chow) had weight gain similar to the high end control in some cases. Their results as given in section 3 of the paper are correct, BTW, but these draw rather limited conclusions. Not enough to justify the title of the paper, much less the resulting press and conclusions drawn from those results. HFCS may indeed make you fatter, but this study simply doesn’t prove that. It’s just that I see this paper cited over and over again, and it bugs me. News organizations need to learn to evaluate the results themselves before making the titles of their misleading articles. People being misinformed and then citing incorrect news articles to back it up, which themselves rely on accidentally or intentionally misleading “research”.. well, that’s kinda annoying. All I’m saying is that to be informed, never trust the news articles themselves. Go to the source. Read the results. Evaluate the data yourself and draw your own conclusions. Use your brain instead of parroting the things you read in news articles. The world would be a better place if people could just think for themselves sometimes. I can’t even express how many times I’ve felt this way. Also, again, you need to read Toothpaste For Dinner. Author OttoPosted on June 21, 2011 June 21, 2011 Categories General SpewTags cartoon, toothpaste for dinnerLeave a comment on WTF is a Fax? “@PeabodyMemphis: @Otto42 Nope, they're still here waiting for someone to come make a fool of themselves.” cc @rseligstein GET ON THAT! I took a trip to canoe in the Buffalo river last weekend, and then followed it up with a week in Kansas City. Didn’t get any river pictures due to a foul up in which the party got separated and the camera got left with the other party, but I snapped a shot from the cabin. Also got some shots from the Boulevard Brewery and a few shots in St. Louis. iPhone pics, the lot of them. I need to get a decent quick shot camera, or a nice Android phone. Either way. If you don’t read Drew and Natalie Dee‘s continual stream of weird, then you should. Okay, I have a very cool boss. Excellent Xmas present. Sorry for the low quality images. My iPhone camera has seen better days.